The ‘javelins’ were actually light spears thrown with a weapon new to the Europeans. A stick the length of a man’s arm, with a grip at one end and a hook to engage the spear at the other, these spear throwers were called atlatl in the Nahuatl language of the Aztecs. 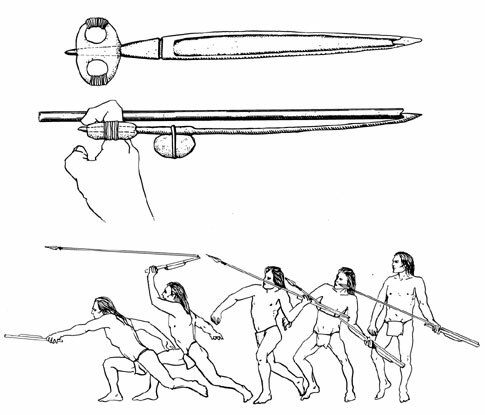 The ‘arm’ of the long atlatl allowed a thrower to fling a light spear much farther and faster than by hand alone. 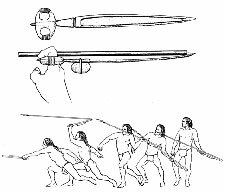 Tipped with a sharp point of obsidian, bone, or hardened wood, these spears were dangerous weapons. Though bows and arrows had replaced atlatls in many parts of the world, the atlatl was an ancient and still important weapon in the Americas when the Spanish arrived. Aztec battles often began with a barrage of arrows and atlatl spears, before the warriors closed in with ‘macuahuitl’s, wooden swords edged with razor-sharp obsidian. This article has kindly been specially written for us by John Whittaker, Professor of Anthropology at Grinnell College, Iowa, USA. 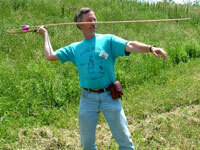 Professor Whittaker is on the Board of Directors of the World Atlatl Association. As they fought their way across Tenochtitlan, the Aztec capital, Cortez and his Spaniards were harassed by showers of arrows and light spears. So heavy was the hail of weapons that one of the chronicles says “The Mexicas furiously hurled their javelins. 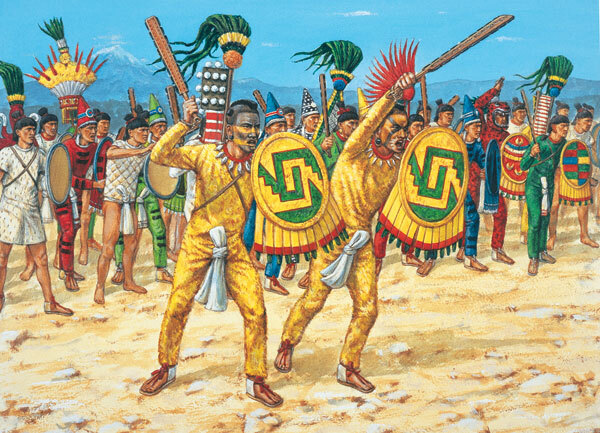 It was as if a layer of yellow cane was spread over the Spaniards.” What the chronicle described as “javelins” were actually light spears thrown with a weapon new to the Europeans. A stick the length of a man’s arm, with a grip at one end and a hook to engage the spear at the other, these spear throwers were called atlatl in the Nahuatl language of the Aztecs. 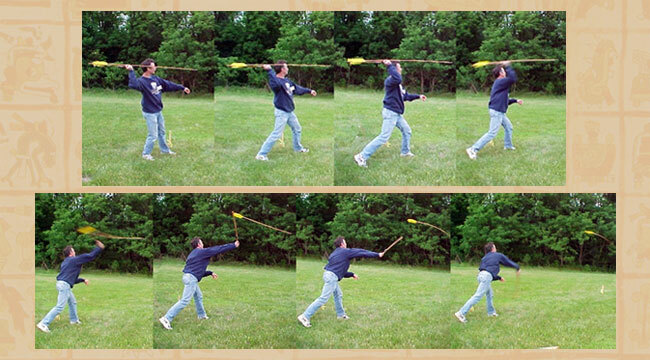 The leverage of the long atlatl allowed a thrower to fling a light spear much farther and faster than by hand alone. Tipped with a sharp point of obsidian, bone, or hardened wood, these spears (usually called darts by atlatlists today) were dangerous weapons. It is frequently claimed that they would have penetrated metal armor. This is not true, but most of the Spaniards would have worn lighter chain mail or leather and padded cotton armor similar to that of the Aztecs, and Garcilaso de la Vega, a veteran of Indian fights in Peru and Florida, complained that atlatl darts would pass clear through a man. 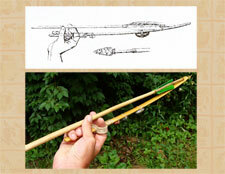 The atlatl was an ancient and important weapon in the Americas when the Spanish arrived. Although different forms of atlatls were invented sometime in the Upper Paleolithic Ice Ages in both the Old and New Worlds, they had been replaced by bows and arrows in most places. However, atlatls survived into modern times in a few places such as Australia, where the bow never arrived, and alongside the bow and arrow in the Arctic and parts of Latin America. In Europe and much of North America we know them only through archaeological finds. 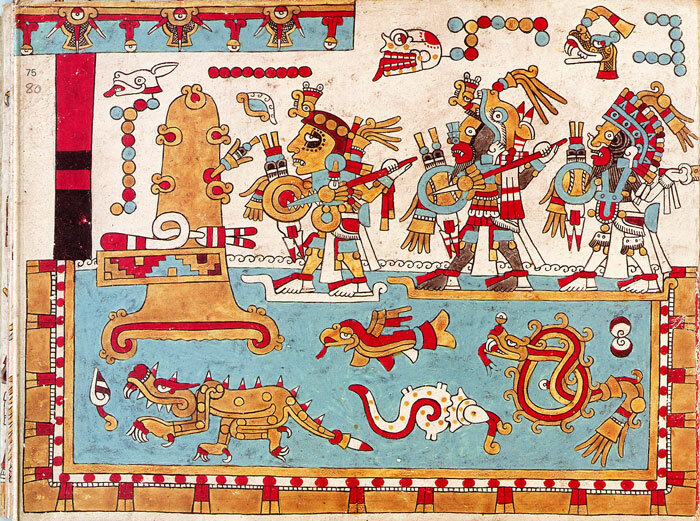 Most of our understanding of Aztec warfare comes from the chronicles of the Spanish and the documents written by the Aztec and their neighbors after they had been conquered. 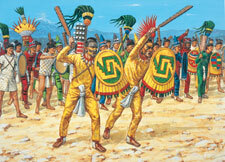 Like the Spanish Empire, the Aztec Empire engaged in wars of conquest, supported an elite class of noble warriors, and sent expeditions against neighboring states. War was aimed at expanding the empire, but warfare was also high drama and religious ritual. Elite warriors gained glory by capturing opponents for sacrifice, so hand weapons and close combat were emphasized. Major battles were apparently begun with a barrage of arrows and atlatl darts, before the warriors closed with macuahuitls, wooden swords edged with razor-sharp obsidian. Even in early warfare where ritual is important and only simple weapons are used, a lot of people may be killed, governments are overthrown, and territory changes hands. 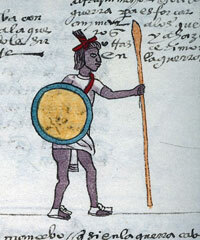 It is quite likely that Aztec warfare was rather similar to the medieval warfare of contemporary Europe where noble knights fought hand to hand with swords and won glory and ransom, but peasant archers with bows and cross bows did most of the damage and actually decided the outcome of battles. In any case, the few atlatls that survive from the Aztec and their neighbors are highly decorated. The British Museum specimen (Pic 5) is probably one of the gifts sent back to the king of Spain by Cortez, which then were passed around the royal houses of Europe. 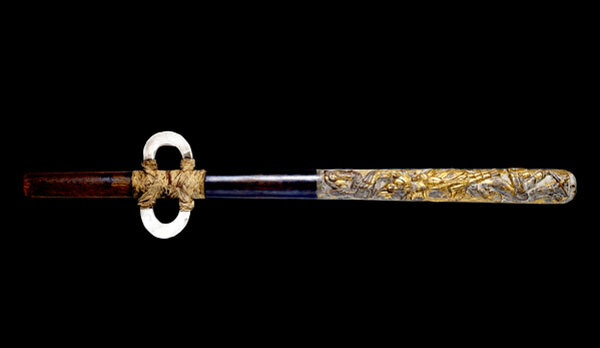 It is elaborately carved, and gorgeously gilded, a work of art fit for tribute to a king, or the weapon of a noble warrior. It is, however, perfectly usable, and we should not be surprised that fine weapons, symbols of power and religious war, were richly decorated. It seems likely that simpler models were used by most warriors, but we don’t know. 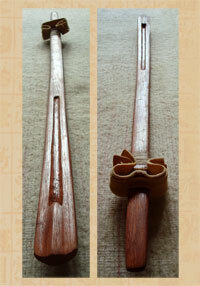 The atlatl itself was also an important symbol of warfare and magical power. 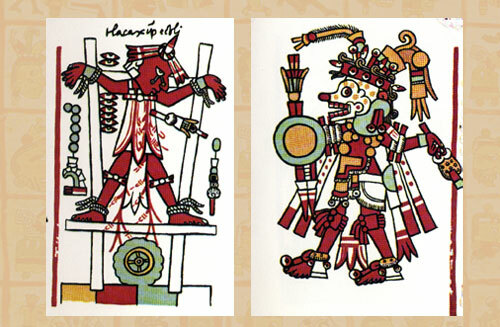 Most of the important Aztec gods were sometimes shown holding atlatls or darts. Zelia Nuttall, who wrote the first important study of Mesoamerican atlatls, noted that atlatls are often shown with snake designs or associated with serpents. The pictures are stylized and not necessarily realistic, but atlatls were also elaborately decorated with feathers, and associated with birds of prey, not too surprising for a weapon that threw a deadly feathered dart. The deity entwined with a snake on the British Museum atlatl could be Huitzilopochtli, a warrior deity, or Mixcoatl, a hunter god from the north, or one of several other gods in the complicated Aztec religion. Although the Spanish explorers who met Aztecs and others using atlatls mentioned the weapons in their chronicles, their accounts of these unfamiliar weapons are brief and often unclear. 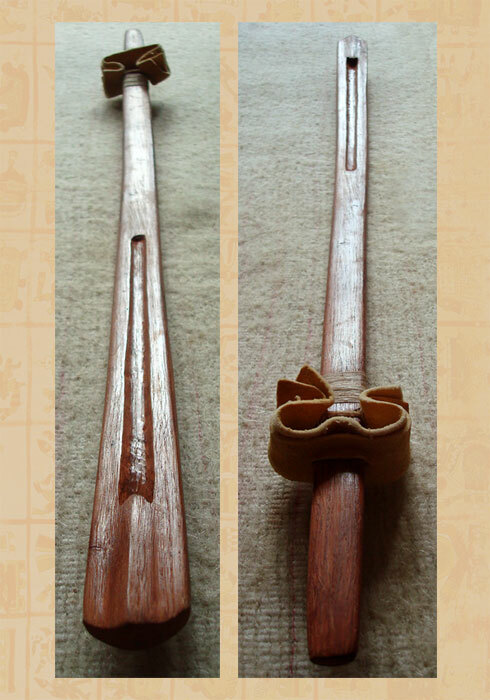 Nevertheless, we know a lot about atlatls, or spear throwers as they are also called. In a few recent societies, atlatls remained in use long enough to be observed by modern anthropologists. The best known examples are some of the Inuit (Eskimo) groups in the Arctic, and the native peoples of Australia. Since modern guns have become available everywhere, there are now very few people who continue to use atlatls for hunting or because they wish to hold onto traditional ways. Modern experiments also teach us a lot about atlatls. As an archaeologist who studies prehistoric technology, I have made and used many different kinds of atlatls, copying both ethnographic forms, and specimens from prehistoric sites. I am not alone; there are now many atlatlists. Only a few of us are archaeologists; most of the modern people skilled in atlatl use learn because hobbies and sports featuring ancient technology have become popular. 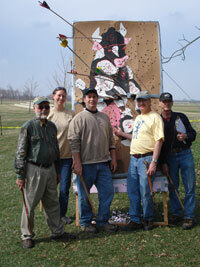 The World Atlatl Association (link below) is the main organization promoting atlatls today. In the United States, there are more than 70 events with atlatl competitions every year, organized by WAA and similar groups, and there are similar events in Europe as well. Competition is generally friendly and informal, and part of the goal is educating the public and encouraging new enthusiasts to join us. A few competitions, like the International Standard Accuracy Contest, are standardized and records are kept, and a number of atlatlists practice and compete seriously. 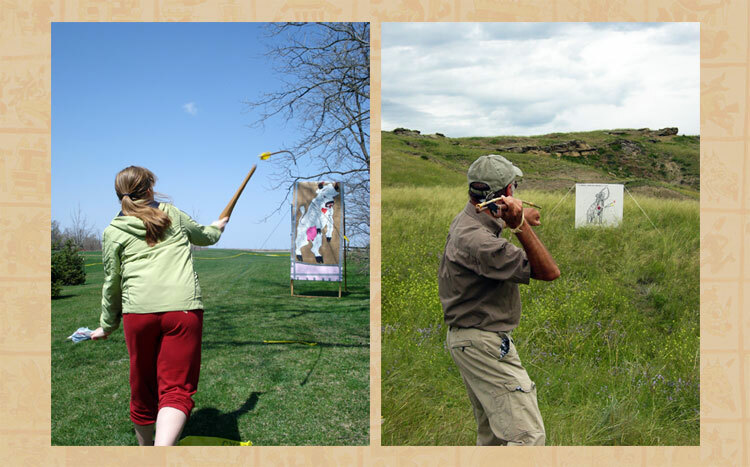 However, we throw at all sorts of targets, from model mammoths to balloons; a few of us have even successfully hunted deer, wild pig, small game, and fish with atlatls - not easy, and only legal in a few states in the U. S.
I work with atlatls for many reasons. First, like archery, atlatling is fun, an enjoyable sport on many levels. It is a great way to teach students and the public about pre-industrial technology. Basic atlatls are easy and cheap to make, but some were also elaborate and beautiful. Most atlatlists find that making and experimenting with different equipment is part of the fun, although there are now a number of people who make and sell good atlatls and darts. 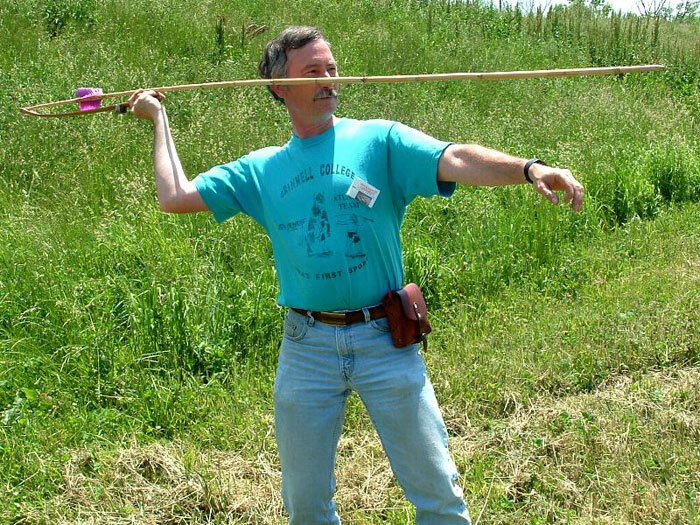 It is also easy to use an atlatl; anyone who can throw a ball can do it. At the same time, it remains a challenging sport. It is more difficult to learn to shoot accurately with an atlatl than with a bow and arrow, and anyone who tries quickly learns to respect the skills and knowledge that went into making and using any ancient weapon. And finally, as an archaeologist, practical experience with atlatls allows me to interpret archaeological finds, and understand old accounts of atlatls. Enough of us have now become expert at using atlatls to judge the advantages and limitations of the weapons Moctezuma marshaled against the invading Spaniards. 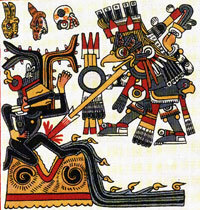 Why would the Aztec continue to use an older weapon, when they had bows and arrows as well? The main advantage of bows is that they are easier to learn to use and to shoot accurately, and they can fire many arrows rapidly. Atlatls on the other hand use a larger, slower projectile. 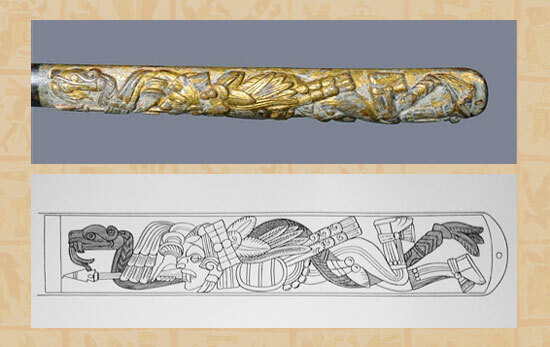 Ancient Mexican art shows warriors carried 3 or 4 darts, rather than the quiver full of arrows possible with a bow. However, the heavier atlatl dart has good penetration, and may have been more effective against Aztec padded cotton armor. Why did I say with confidence that stone-tipped atlatl darts did not penetrate Spanish steel plate armor? Because modern experiments have tried, and failed. These weapons served the Aztec well, and are still effective, but modern atlatlists now understand their advantages and limitations better than the early chroniclers and archaeologists. • Pic 11: photo by Ian Mursell/Mexicolore. *Special thanks to Chuck LaRue for the atlatl! I thank the writers and publishers becoause of you I have found new and helpful information!!!! I think that there’s confusion about whether the atlatl’s dart could penetrate steel armour. I have read many times the “Historia Verdadera de la Conquista de la Nueva España” by Bernal Díaz del Castillo and there’s no reference to “steel armour” - only says that the dart could penetrate “any armour” (literally: el suelo hecho parva de varas tostadas de a dos gajos, que pasan cualquiera arma y las entrañas adonde no hay defensa. 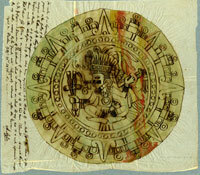 Chapter LXV). I think that Bernal Díaz referred to the quilted cotton armour used by mesoamericans and then adopted by spaniard conquistadores.